Directed by William Keighley and Michael Curtiz, and starring Errol Flynn, Claude Rains, and Olivia de Havilland, The Adventures of Robin Hood (1938) is the quintessential imagining of the Robin Hood legend, solidifying the character’s fame in the pantheon of American film. It was filmed inbeautiful Technicolor and became a definitive telling of the outlaw’s story. A film seems to harken back to a simpler time, as it “exists in an eternal summer of bravery and romance,” as Roger Ebert once said (Ebert, 2003). The film opens to a dire situation for the Saxon peasants in England. Their King, Richard (Ian Hunter), is captured and held for ransom by Leopold of Austria. Richard’s brother, Prince John (Claude Rains), takes this opportunity to clear the English government of anyone opposed to him and seizes power for himself. He then levies a hefty tax on the Saxons to accrue enough wealth to buy his way to the throne. The tax collecting methods prove to be brutal on the Saxons, and many are being forced out of their homes, beaten by the Norman tax collectors. It is in the midst of this injustice Sir Robin of Locksley (Errol Flynn) comes forward. 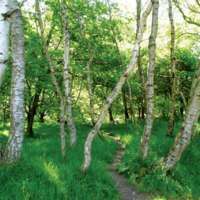 Bent on fighting against injustice at the hands of the Normans, Sir Robin forms a group of outlaws in Sherwood Forest to resist Prince John and help the Saxons. It is not long before Robin, known as Robin Hood, and his men begin to rob the rich to give to the poor and to ensure the proper coin is put aside for Richard’s ransom. Upon capturing Sir Guy of Gisborne (Basil Rathbone) and the rest of his convoy, Robin is able to convince Lady Marian (Olivia de Havilland) why he fights John, and she soon assists Robin multiple times. The film ends with Robin and King Richard surprising John with their return moments before John is to declare himself new King of England. Robin saves Marian, who was to be killed for treason once John had been crowned, and Richard is restored to the throne. The resistance formed by Robin Hood in the form of his “merry men,” to “rob the rich and feed the poor,” his romance with Maid Marian, and the eventual restoration of King Richard to power, are all grounded in a story about the oppressed “Saxons” and the ruling “Normans” as metaphors for social hierarchies in the medieval and modern world. The film’s message of social justice has proven to be its most timeless and resonant aspect (Aberth), with its visuals highlighting the contrast between the Saxons and Normans, yet the film still manages to communicate a particularly conservative message through Robin’s loyalty to King Richard. It is clear to see why social justice is a compelling theme in Adventures, Robin’s maxim of “it’s injustice that I hate not the Normans,” is so simply heroic, that it sums up the appeal of Flynn’s role of the swashbuckling rogue with a heart of gold. The aesthetic differences drawn between the abodes of the Saxons and the Normans highlight the differences between the privileged and the oppressed. The very strong and ordered castle of Sir Guy, one of the stand-ins for Norman power, is very cleanly defined with straight angles and dull colors of stone and the flashes of the Knight's banners. It can be contrasted with the vibrant and warm countryside that Robin and the Saxons inhabit (Aberth, 142). A connection with the land and a certain down-to-earth attitude characterizes the Saxons, while the Normans are depicted to be disconnected from it all; out of touch and in their literal castles on hills, as Sir Guy’s castle can be clearly seen to be perched on a hill early in the film, visually showing the Normans to be a world apart from the Saxons. This juxtaposition between the Normans and the Saxons creates a visual line between both the ethnic groups and the social classes they represent. 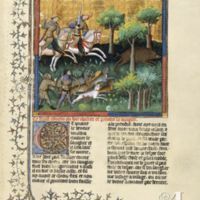 The peasants are also seen to be more in harmony with nature, the skills they have are practical ones, Little John (Alan Hale Sr.) is a quarterstaff master, Much (Herbert Mundin) is a skilled hunter, meanwhile the nobility is mostly known for their taxation and ceremonies, such as the first banquet, the archery tournament, and John’s coronation. These worlds visually cement the divide between the “corrupt court world” and the “healing green world” (Aberth, 142). This contrast between Norman and Saxon also suggests peasants to more crucial to society, as it is their production of wealth that is turning the gears of state, it is their skills that are needed to run society, and it is their anger that brings them freedom. However, despite Robin’s defense of the downtrodden, the strong conservative undertones of Adventures must be noted. While Robin is a champion of the people, he is still unabashedly a monarchist (Callenbach, 42). Robin does not redistribute the taxes back to the poor after confiscating the wealth from Sir Guy because his intentions are clear from the beginning: to ensure the money goes to Richard’s ransom, and not to John’s efforts to buy his way to the throne. This motive communicates that the power of the monarchy is the true authority, and Robin is simply protecting it from a usurper. His loyalty to Richard is his main motivation for confiscating the taxes, and thereby communicates a message centered in upholding the status quo that may be lost on a less careful viewer (Callenbach, 43). Robin’s motivation falls in line with Hilton Keen’s viewpoint on the hero as a more “legal,” rather than “social,” reformer (Aberth, 135). The representation of gender and women’s agency can also be explored in the film through the characterization of Marian and her servant, Bess. Both women are members of the Norman nobility and through their own volition choose to aid Robin Hood against the interests of their own people. For Marian, this motivation mostly comes from moral obligation, as she is moved when Robin Hood shows her the conditions the poor live in; Bess, unlike Marian, seems to mostly be motivated by a romance she forms with Much. Marian, however, chooses to aid Robin’s escape from prison, and she holds fast to her own convictions, though it is significant that she merely switches from submitting to Guy and John to submitting to Robin. While she does grow to love Robin, she does make herself heard when she believes she knows what to do. And although she did not carry out the rescue mission and did not fight Sir Guy in the end, it was Marian who decided to stay in the castle to keep an eye on John and Sir Guy, and it was she who made the plan for Robin’s escape, and it was the “Merry Men” who listened to her advice. It is something quite refreshing to see Marian’s words not fall on deaf ears. Despite her being a “damsel in distress,” she is still depicted as one with agency. Despite this, she is still ultimately a submissive figure, and a product of the Norman aristocracy who is supposed to know her place in the gender hierarchy (Stock and Gregory-Abbott, 203). Bess, on the other hand is seen as far more outspoken and less submissive than Marian. When Sir Guy’s entourage is captures by the “Merry Men,” Marian speaks little while Bess steps out of her conventional place to threaten anyone who may harm Marian. Bess’ character also pushes the boundaries of the depiction of women in Adventures in how she is sexualized (Stock and Gregory-Abbott, 203). In her flirtatious conversation with Much, Bess mentions having five previous relationships. An unusual level of sexual openness for a woman that age, she pushes the boundaries of medieval women’s portrayal in the film. Bess’s interactions with Much and the Merry Men at the tavern also give her a more active role than Marian, who is held up in the castle. Bess’ active coordination is an example of real action, which seems more powerful than Marian’s speech defending Robin Hood to Sir Guy and John in comparison (Stock and Gregory-Abbott, 204). The Adventures of Robin Hood is a heartwarming, hopeful adventure that is both a pleasure to watch for its excitement as well as its characters. Its contribution to making Robin Hood a classic figure of cinema, as well as characters such as Little John, Friar Tuck (Eugene Pallette), and Marian, is of undeniable importance to the history of cinema as well as our popular conception of the folk hero. Aberth, John. Knight at the Movies. New York, NY: Routledge, 1993. Callenbach, Ernest. "Comparative Anatomy of Folk-Myth Films: Robin Hood and Antonio Das Mortes." Film Quarterly 23, no. 2 (1969): 42-47. Ebert, Roger. 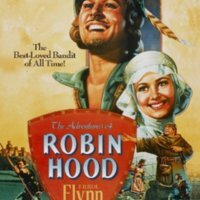 “The Adventures of Robin Hood (1938).” rogerebert.com, 17 Aug. 2003. Stock, Lorraine K., and Candace Gregory-Abbott. Race, Class, and Gender in Medieval Cinema. Basingstoke, United Kingdom: Palgrave Macmillan, 2016. Raine, Norman Reilly, and Seton I. Miller. “The Adventures of Robin Hood.” The Adventures of Robin Hood (1938) - Rotten Tomatoes, 8 Jan. 2018.